BOTOX® is a prescription medicine popular in both men and women, it is injected into muscles and used to temporarily improve the look of moderate to severe crow’s feet lines, and frown lines between the eyebrows in adults. Botox in the UK can also be used to treat some other conditions such as hyperhidrosis (excessive sweating), gummy smiles, grinding teeth and those suffering from severe migraines. We offer Botox fillers/injections in both our Nottingham and London clinics, get in touch for your free consultation today. Botox® is the trade name for the commercial version of Botulinum Toxin, made by the company Allergan. Botox UK is a purified protein extracted from Botulinum bacteria used for anti-ageing treatments. It’s been used for treating wrinkles since the 90s and is the most common cosmetic procedure in the world. 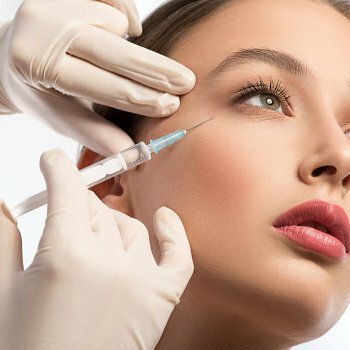 Botox has undergone extensive clinical trials and is licensed for cosmetic use in the UK by the Medicines and Healthcare products Regulatory Agency (MHRA). Botox is a prescribed medicine - you must see a Doctor or Nurse before you can obtain a prescription. The collagen in our skin eventually wears away as we age due to overactive muscle movements. This reduction in collagen can cause the skin to crease and produce undesirable effects such as crows feet, frown lines and lines on the forehead, which can be very ageing. Botulin works by relaxing these muscles which can cause the skin to relax as well. Lines and wrinkles are smoothed out or disappear altogether. The Botulin protein only produces its effects on the muscles it is administered to therefore there will be no effects on other parts of the body. The cost of botox in the UK and London can range as it depends on the type of botox you opt for, and your individual circumstances. • Our botox treatments start from £169 upwards, but this will depend on your specific needs. • You will discuss your treatment and the costs in greater detail during your initial consultation at Zenith Cosmetic Clinics. • After your treatment, you will also receive a free review and top up 2 weeks later if it is required. Botox can take as little as 10–15 minutes, it requires no form of sedative or anaesthetic so you can carry on as normal immediately after. Is there any downtime needed after my Botox treatment? No there is no downtime needed after your Botox treatment. Remember to make sure you follow the aftercare advice that we give you. When will I see the results of the Botox? Results become visible about 8 days later and the effects last between three and four months. Why two weeks for the Botox follow up? This isn’t obligatory. It’s to make sure both you and we are happy with the end results and can make any adjustments as we see necessary. We wouldn’t do this before, as it can take up to two weeks to see the full effects. Botox isn’t generally a painful procedure, the needles used for the injections are very small (limiting the pain). It can take up to 2 weeks to see the full effects of your Botox treatment. Are botox side effects common? Side effects are possible for any procedure, however, serious side effects are not common with Botox. Are botox injections safe during pregnancy? It is not recommended to have Botox whilst pregnant. Not just anyone can administer Botox, only those who are highly qualified and experienced should administer botox. Will botox lift my eyebrows? Whilst Botox can be used to lift your eyebrows, the effect is generally quite subtle. For a more drastic lift, a brow lift may be better suited. One of the key benefits of botox is the minimal downtime required. The effects from Botox injections will last between four and six months. Here at Zenith Cosmetic, we offer both your consultation and botox treatment in our clinic based in the heart of Nottingham. Don’t hesitate to get in contact with our team, we’re here to answer any of the questions you have around botox and anti-wrinkle injections. Arrange your consultation in Nottingham today. Our botox service is always available to patients in London, so if this location is more convenient for you get in touch with our team to arrange a consultation today! If you do have any questions prior to your consultation, our team is more than happy to help.